We had given the latest APPSC Panchayat Secretary Syllabus 2019 on this page. So, candidates who have applied for the APPSC Panchayat Secretary Recruitment 2019 must refer to this page. The higher authorities of Andhra Pradesh Public Service Commission (APPSC) were ready to conduct the Screening Test, Mains Examination. To get placed as Panchayat Secretary, you must attempt the Screening Test on 21st April 2019 and the Mains Examination on 2nd August 2019 tentatively. You can also check the latest psc.ap.gov.in Selection Process 2019, the ఆంధ్ర ప్రదేశ్ పబ్లిక్ సర్వీస్ కమిషన్ Exam Pattern 2019. To the bottom of this page, we had inserted the direct link to download the APPSC Panchayat Secretary Syllabus 2019 PDF easily. Well, the officials of the Andhra Pradesh Public Service Commission decided to hire candidates with a certain psc.ap.gov.in Selection Process 2019. 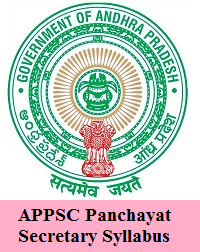 So, candidates who have applied for the APPSC Panchayat Recruitment 2019 must check the below procedure so that you can start preparing. Candidates must check the Andhra Pradesh PSC Exam Pattern 2019 before starting the preparation. They are planning to conduct the Screening Test of Offline Mode, and on the other hand, the Mains Exam will be of Computer Based Test Online Mode. Now, you can start preparing after checking the below given Test Patterns. Check the exact dates of the written examination from this page. NEGATIVE MARKS: As per G.O.Ms. No.235, Finance (HR-I, Plg & Policy) Dept., Dt.06/12/2016, for each wrong answer will be penalized with 1/3rd of the marks prescribed for the question. NEGATIVE MARKS: As per G.O.Ms. No.235, Finance (HR-I, Plg & Policy) Dept., Dt.06/12/2016, for each wrong answer will be penalized with 1/3 rd of the marks prescribed for the question. Candidates can easily download the APPSC Panchayat Secretary Syllabus 2019 in PDF format for free of cost. And also, we have provided the exact syllabus gathered from the official site. So, prepare along with the topics included in the APPSC Panchayat Syllabus 2019 PDF. Time management and answering speed will play an important role. Therefore, make sure with all the topics to cover before the examination. The direct link given below helps you to download the ఆంధ్ర ప్రదేశ్ పబ్లిక్ సర్వీస్ కమిషన్ Syllabus For Panchayat Secretary post. We hope that the above provided information about the APPSC Panchayat Secretary Syllabus 2019 is useful. So, to get all such latest updates, candidates need to stick on to us on FreshersNow.Com.